I remember the first time I came to Shanghai three years ago, I didn't think much of it. Then perhaps because the idea of Shanghai generates such enthusiasm everywhere, I, too, became quite enthralled with it on my following visits. Yet, having just spent the previous 5+ weeks in some of Asia's other great cities (Tokyo, Taipei and Seoul), I find myself having a very poor initial reaction to Shanghai this time around. Somehow all the things that didn't bother me the last two times are bothering the hell out of me. The constant honking. Bicycles everywhere. Dirty little cabs. Poor little 5-year-old girls made to sell flowers on the street. The phlegm, oh the phlegm. The horrible Internet access (a lot of sites that I read just aren't reachable from China for some reason ~ including my own figure-ground.com ~ damn you communist censor bureau or whatever hell else agency is responsible for this). Etc, etc. But mostly, it's the lack of manners of the mainlanders that really put me off. It's only been a few hours, maybe I'll get over my initial repulsion and get back to appreciating the positives of this city. The last 5 days have gone by in a drunken, tired blur. I'm not sure if it's the cummulative effect of 5 weeks of being away from home or it's just Seoul, I have been really, really tired ever since arriving here four days ago. Mostly I think it's the one-two punch of not sleeping at all the last night in Taipei and the bottle of Jack Daniels on an empty stomach the moment I arrived in Seoul. I never really recovered fully after that. Anyway, some final thoughts on my month in Taipei. People talk about globalization and how the world is getting smaller all the time, this is how it has impacted me: Thanks to broadband Internet and the power of BitTorrent (best client: here), I was able to continue watching all the shows I watch back home. And thanks to webcams and Skype, I was able to see and interact with my family almost on a daily basis. And thanks to mlb.tv, I was able to watch every single Yankee playoff game (including the last four excruciating defeats). It's little things like that that can help lessen homesickness (although I could have lived without watching the heinous Yankees-Red Sox series). The month went by much quicker than I had expected. Where did all the time go? I didn't end up doing anything I had thought I might have time to do, like traveling around Taiwan for a few days, for example. Or, I had wanted to eat 20 sticks of 豬血糕/Zhu Xie Gao and 20 bowls of 牛肉麵/beef noodle soup and I only managed 15 sticks of 豬血糕 and 14 bowls of 牛肉麵 (see the comments section of my 牛伯伯 vs. 牛爸爸 post for a list of all the places I tried). But somehow, without trying, I consumed a whopping 16 plates of 涼麵/cold noodles. Damn you, Leslie, it's all your fault. If that sounds like a LOT of carbs to you, it is. I don't care who you are, if the next time you see me you tell me I gained weight, I will not hesistate to punch you in the face. I know I'm fat, I don't need you to tell me. Actually, no "rest in peace" for these damn Yankees. I hope the over-paid chokers burn in hell for having the greatest collapse in sports history. Against the Red Sox, no less. I don't want to hear anymore about how the Yankees "know how to win" from now on... Thanks for making my last day in Taipei a miserable one. 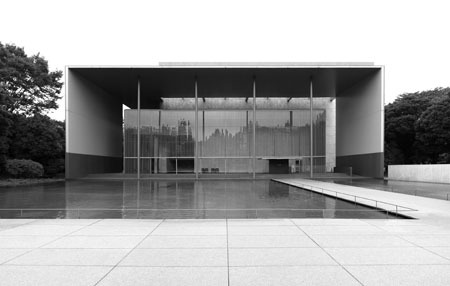 [From Figure/Ground] For those of you not familiar with the new MoMA's architect, Yoshio Taniguchi, here are a few shots of a gallery he designed a few years ago for the Tokyo National Museum. You can see some of the same elements he's using in the new MoMA. Click here to see the gallery at Figure/Ground. The Yanks may be Pedro's daddy, but the Sox are Mariano's. Okay, we're still up 3-1, and there's no reason for me to even make a post about one measely lost. It just hurts a little bit more when you have to watch it by dragging yourself out of bed at an ungodly hour (7:30am Taipei time) and watching it while the whole time wishing you were still asleep. I'm bitter, it's all. I was hoping to not to have to get up again tomorrow (at an even more insane 5am), but now I will have to. Damn you Mariano. I blame you. Second blown save just this postseason. Tsk. Tsk. More snapshots from Taipei (and a couple from Kaohsiung, too... including a shot of my notoriously camera-shy uncle). Somehow my month in Taiwan is almost over and I haven't done anything I thought I would do. Yet, the time has flown by quickly and with lots of fun. This photo so accurately captures their relationship. Him, yakking away incessently. Her, thoroughly bewildered, yet completely engrossed by his nonsense. 05: Leslie conquering many, many plates of his favorite cold noodles. To be fair, two of those plates were mine. I've put up some snapshots of friends and family from my first week in Taipei. Stylistically, the movie is very similar to 《花樣年華》/In the Mood for Love, but while that movie was very simple story-wise, this one is a lot more complicated, more like 《阿飛正傳》/Days of Being Wild. There are lots of storylines and characters. Even though it's more story driven than In the Mood for Love, it's still very much a mood piece. WKW himself says 2046 isn't really a sequel to Mood. But I think it's fair to think of 2046, Mood and Days as three different looks at "love" through the milieu of 1960s Hong Kong. 章子怡/Zhang Ziyi is beyond gorgeous in this movie. So. Beautiful. So beautiful I want to cry. 鞏俐/Gong Li looks awful. What the hell happened to her? Once upon a time she was pretty. I know she's a 老女人 now, but still... Speaking of which, 劉嘉玲/Carina Lau looks pretty bad too, but I suppose it's kind of her character. She plays the same character from Days of Being Wild, but kind of all spent and tired from all that happened previously. Since I'm critiquing all the women: 王菲/Faye Wong looks good. The andriod look suits her. Just like Mood, the soundtrack is beautiful. While not necessary, I would recommend watching Days of Being Wild and In the Mood for Love again before seeing this one. It ties together stories from those two previous movies. Starting yesterday, all visitors to the U.S. (including the previously exempt people from the visa-waiver countries) are being fingerprinted and photographed under a new revision to the US-VISIT program. I guess there wasn't much fuss made over it or something since I hadn't heard anything about it until today (and I usually try to keep an eye out for stuff like this). I sort of understood the previous requirement to fingerprint and photograph not so much as a criminal check but more of a biometric identification procedure. They fingerprint you at your home country when you apply for a visa and when you show up in the U.S., they fingerprint you again to digitally match you up with the visa to ensure that you are the same person who applied for the visa. Or at least that's how I understood it. And that made sense to me. But now, they are fingerprinting everyone, even those who don't need, and therefore didn't apply for, a visa. So what are they using the fingerprints for exactly? It's not to ID you to your passport. They are basically just going to compile a huge database of everybody's faces and fingerprints. Lovely. And you can be sure, despite whatever assurances they give, that the Department of Homeland Security will keep them all on file forever. Luckily, Canadiana (and Mexicans) are still exempt. For now. Along with the Patriot Act, the U.S. is becoming such a hostile country to be in for visitors and its own citizens alike.